Over the last two years, the U.S. has had a spike in expatriations. It isn’t exactly Ellis Island in reverse, but it’s more than a dribble. With global tax reporting and FATCA, the list of the individuals who renounced is up. For 2013, there was a 221% increase, with record numbers of Americans renouncing. The Treasury Department is required to publish a quarterly list, but these numbers are under-stated, some say considerably. The presence or absence of tax motivation is no longer relevant, but that could change. After Facebook co-founder Eduardo Saverin departed for Singapore, Senators Chuck Schumer and Bob Casey introduced a bill to double the exit tax to 30% for anyone leaving the U.S. for tax reasons. That hasn’t happened, but taxes are still a big issue for many. 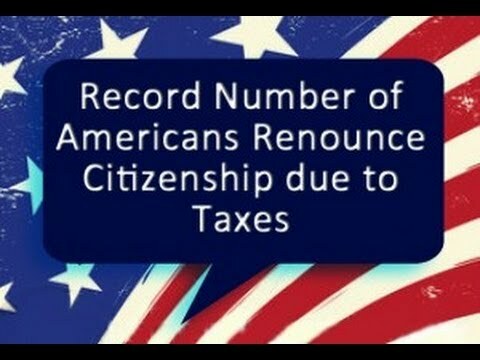 To leave America, you generally must prove 5 years of U.S. tax compliance. If you have a net worth greater than $2 million or average annual net income tax for the 5 previous years of $157,000 or more for 2014 (that’s tax, not income), you pay an exit tax. It is a capital gain tax as if you sold your property when you left. At least there’s an exemption of $680,000 for 2014. Long-term residents giving up a Green Card can be required to pay the tax too. 1. Consular officers must confirm that the potential renunciant fully understands the consequences of renunciation, including losing the right to reside in the United States without documentation as an alien. 2. Consular officers must verify that the renunciant is a U.S. citizen and they must conduct a minimum of two intensive interviews with the potential renunciant. Consular officers must even review at least three consular systems before administering the oath of renunciation. 3. The final approval of the loss of nationality must be done within the Directorate of Overseas Citizens Services in Washington, D.C. After that, the case is returned to the Consular officer overseas for final delivery of the Certificate of Loss of Nationality to the renunciant. 4. These steps add to the time and labor be involved in the process. Accordingly, the Department is increasing the fee for processing such requests from $450 to $2,350.